Caring for your pets doesn’t just mean providing them food, water, shelter, and grooming. There will also be times when you need to administer a medication orally, put drops into the ear, or otherwise provide simple medical care. While administering medications to your pets will likely be challenging, it is absolutely manageable, especially if you follow the guidelines and tips we’ll share below! With that said: if any advice offered below goes against the medication instruction label, we defer to the makers of the medication. Please follow the instructions on the medication first and foremost. Our information is only meant to supplement and complement, not contradict, the instructions you’ve received. The most important piece of advice we (or VCA Hospitals) can give you, regardless of medication type, is this: always wash your hands both before and after administering medication to your pet. This will help keep them safe as well as you (and any other pets in the household!). You’ve got a special pet if they’ll accept a pill for what it is. Most pet parents have to hide the pill in food, a treat, or a pill pocket. 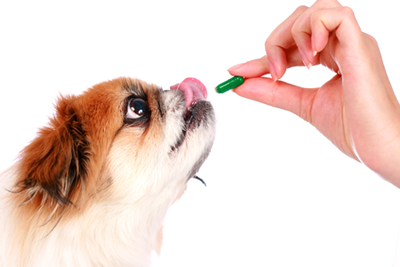 If you choose to hide your pet’s medication in food, choose something you know your pet enjoys. For instance, consider mixing the medication into your pet’s wet food. If your pet quickly discovers the pill and picks it out or leaves it behind, consider something that’s harder, like a small piece of cheese—you can push the pill right into the center of a small cheese square. Lastly, there are “pill pockets.” They’re essentially hollow treats and you can find them at any major pet specialty store.You may also purchase them next time you visit our clinic. What if this tactic fails though? What if masking the pill simply doesn’t work with your pet? In this case, you’ll have to administer the pill directly. Bring your pet into a comfortable area that you can close off such as a familiar bedroom. Ensure that you’ve lubricated the pill slightly with margarine or even butter, but only with enough to prevent the pill from getting caught in your pet’s throat. As you hold the pill in one hand, open your pet’s mouth from above with your other. Then, as gently as you possible can, you’ll tilt your pet’s head back, and the lower jaw should open. Put the pill in your pet’s mouth as far back as you can, then close your pet’s mouth and return it to a normal position. Gently massage your pet’s throat to stimulate swallowing. If you’re able to successfully administer the pill using either technique described above, immediately offer a treat along with praise. Make medication administration a pleasant experience for your pet to whatever extent you can! Firstly, because ear drop administration might already be an unpleasant experience for a suffering pet, try to reduce discomfort by warming any cold or refrigerated ear drops. You can do this by leaving the bottle of drops in a bowl of warm water for a few minutes. When you approach your pet, try to get them comfortable, for instance, by having them lay in your lap (or at least rest their head in your lap). Prepare the medication by pulling the drops up into a dropper, or hold the bottle in position and be ready to squeeze it. Now, with your free hand, gently adjust your pet’s ear as needed. For pets with floppy ears you’ll want to hold the ear flap straight up. Administer the prescribed number of drops directly into the ear canal, and then lightly rub the base of the ear against your pet’s head in a circular motion to promote the medication’s movement deeper into the ear canal. Once you release your pet they may shake their head or be inclined to rub their ears. This is normal and shouldn’t counteract the efforts you just made to give them treatment. Your pet is likely just experiencing a strange sensation and is coping with that. As always, be sure to give your pet a small treat and plenty of praise immediately after administering medications to normalize the experience. For more cooperative pets this might be rather simple: you might simply support them in place, tilt their head back, and administer the eye drops. But for most of you, it won’t be that easy. We all have an aversion to foreign objects coming near our eyes and our pets are no different. The simplest way to ensure you administer this medication is to wrap your pet gently in a blanket or towel, all while speaking in a soothing and pleased voice. Once your pet is snug as a bug in a rug (with their paws restrained under the blanket), you can use one hand to gently lift the eyelid, and the other to administer the eye drops, ensuring that the dropper never risks contact with the eye’s surface. If you hold the eyedropper about one inch away from the eye it should be more than sufficient space while still allowing you to aim accurately. The final step is, of course, to give treats and praise! Just as we sometimes resist medications, especially when we’re younger and the administration process is brand new, our pets often have reservations too. The important thing is that you choose to make this moment one that builds trust between you and your pet, rather than the experience being so scary for your pet that it damages the trust you’ve already established. With patience, love, and gentleness you’ll help your pet be healthier, more comfortable, and more trusting of you. Should you find your at home treatment isn’t working as intended, never hesitate to give NOVA Pets a call at (703) 378-9791. We may be able to assist you to ensure your pets treatment goes according to plan.